All these are responsible for most of the diseases that torment humans. The beauty of ellagic acd is that it inhibits the ability of these bad actors from being able to operate. When the body is in balance, yeast, candida are kept in check. One of the most promising health benefits of ellagic acid is its ability to inhibit the growth of cancer/tumor cells in lab experiments. While more research is needed, this has generated much excitement. How does ellagic acid achieve this? Ellagic acid inhibits the growth of cancer cells by disabling the enzyme the cancer cells need to form new blood vessels. Ellagic acid is a polyphenol found in plants such as.. If you have been a subscriber to my newsletter for a while, or a constant visitor to my web site, you know I always pride myself on looking for, and presenting information about the latest natural health discovery. Or those that have been forgotten, suppressed for the sake of profits, or just plain neglected. It was discovered in 1831! I know what you're thinking, and I have such question too: Why did it take this long to do this kind of research, given the toll that cancer alone exerts? Now let's look at parasites. WRONG, and deadly so too!!! EVERYONE on earth is infected by parasites!! The National Geographic in its documentary "The Body Snatchers" says that parasite infections have resulted in more human death than ALL the wars in history-combined!!! One of the health benefits of ellagic acid is in helping the body get rid of parasites. Read more about parasite infection and how to get rid of it at this link. Parasites, viruses, candida, yeast, fungi, bacteria-these are at the root of most of man's health problems. If we can defeat these, we'll hardly ever be sick. And this is where Ellagica comes in. 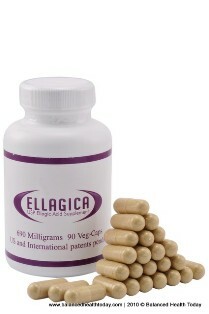 Ellagica is the most potent form of ellagic acid in the market today.